I served chai bread for a ladies luncheon last summer. Subtly spiced, it was a lovely addition to the tea breads. It is also perfect for holiday dinners and buffets. And, as my friend Apple Valley Sue pointed out, it makes a very nice gift! Sue was my Secret Sister one year and gifted me with some chai tea bags – my introduction to the beautiful flavors of chai. I promised to get the recipe to Sue before the holidays so chai bread can be gifted to a hostess, a teacher, a neighbor or anyone else! So here it is!!! Cardamom adds to the distinctive chai flavor. It is a rather expensive spice so do watch through the year for a spice sale or check the ethnic aisle (or ethnic stores, if you are lucky enough to have them nearby.) I use a chai tea bag to make the tea, but you can also use regular Lipton orange Pekoe. Let it steep at least 5 minutes to strengthen the chai flavor. Then make another cup to take five after you have the bread in the oven. The high baking temperature creates a crisp crust with a soft center. If the crust is deeply browned and the center wet and gooey the first time you do the toothpick check, reduce the temperature to 375. Your oven’s temperament outranks the directions always. Don’t be afraid to adjust temperature and time as needed. 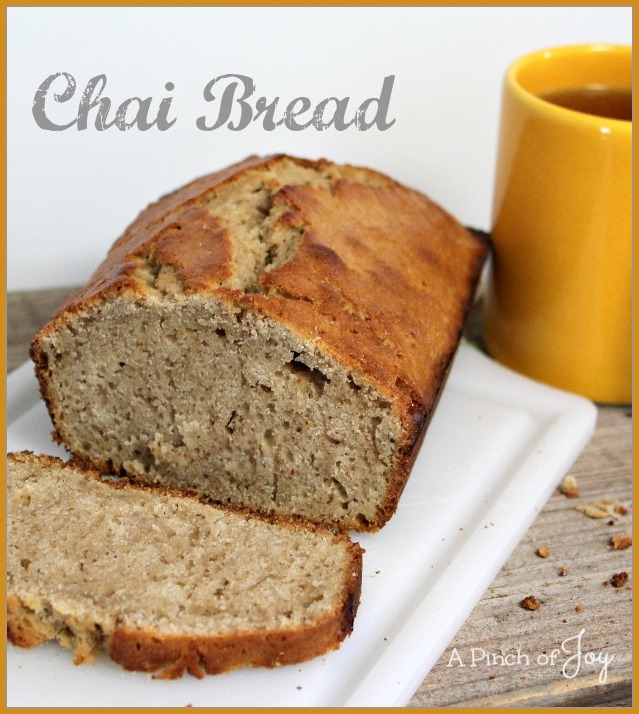 You can make a powdered sugar glaze for the top of chai bread, however we prefer it plain (fewer carbs). The bread will keep up to four days without refrigeration or up to 10 days with refrigeration. Also freezes well, unsliced, for up to 3 months. A subtly spiced quick bread, perfect for a buffet, a holiday dinner or just because. Place one chai tea bag in half cup of hot water and let steep until needed. Preheat oven to 400 degrees F. Spray bottom only of 9x5 loaf pan. Beat sugar and butter with electric mixer on medium speed until fluffy. On low speed, add tea, milk, eggs and vanilla until well mixed. The mixture will be thin and will look curdled. Add all dry ingredients and stir gently until just mixed. Pour into baking pan and spread batter uniformly across the pan. Bake for 40-50 minutes until toothpick inserted into middle comes out clean. Edges should pull away from sides of pan and be golden brown. Do not underbake. When done, remove from oven and let cool in pan for about 10 minutes, before turning out on cooling rack. My mom used to make a Swedish cardamon bread when I was growing up that was so good. I cannot find her recipe. Her’s was a traditional raised bread… I’ll look forward to trying your recipe, Charlene. Diane | An Extraordinary Day recently posted…Keep Thanking God… :: Joy Day!